What do we really know about the Kirby Park Zoo? The Kirby Park Zoo, once located in Kirby Park somewhere along the river, completely vanished into history during the World War II era. Still, the zoo is one of Wilkes-Barre’s legends. And rightly so, it is captivating to imagine a simpler time when communities nationwide not only had amusement parks right in their own back yards, but municipal zoos were also popular local attractions. And the Kirby Park Zoo was popular! 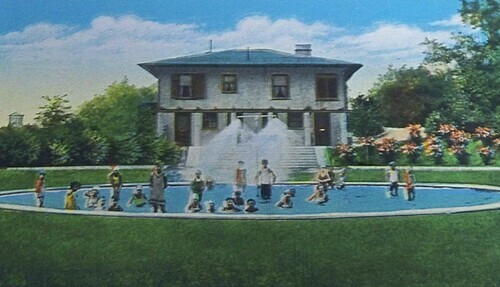 It had somewhere between 2,000 to 3,000 visitors during the weekends in the summer months, according to newspaper coverage from the days when the zoo was in operation. I don’t quite understand why, but there is a tendency for locals to “spin” these regional venues in such a way that they become shrouded in controversy and mystery over time. It must be a function of the human mind to weave our childhood fantasies into our memories about events and locations. When I was doing research about the Kirby Park Zoo, on more than one occasion, people told me that their deceased relatives told them stories about the elephants of the Kirby Park Zoo. Which is just bizarre, there is no way that the city of Wilkes-Barre housed elephants right next to the Susquehanna River! I wrote these instances off as just a miscommunication created as a result of being a generation or two removed from actual historical events. 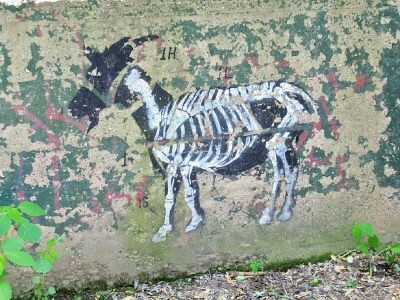 But I recently became aware of the fact that this phenomenon also happens within the generation of people with first-hand experience, while photographing the remains of the now defunct Nay Aug Park Zoo in Scranton. A couple stopped by the remaining zoo cages with their adult children, and proceeded to tell them about their “memories” of the giraffes that lived right there–in the elephant house! Apparently, when you DO have elephants in your local zoo, people remember giraffes instead! The mystery surrounding the Kirby Park Zoo is magnified by the fact that the location itself was cut off from Kirby Park more than 70 years ago when the levee was constructed to protect the area from flooding. While the park on one side of the levee remained a neatly manicured public area, the other side became overgrown and even served as an illegal dumping ground for unwanted debris for several decades. During the 1990s, preservationists started clearing the long-forgotten area between the levee and the Susquehanna River, uncovering a handful of lost ruins. That’s when the urban legends about the long forgotten Kirby Park Zoo began to grow as more people began to frequent the area while walking or fishing along the Olmsted Trail and would come across these structures. Through research, I’ve learned that the Kirby Park Zoo was mentioned in the original Olmsted Brother’s plans for Kirby Park, but as far as I can tell (please, someone prove me wrong! 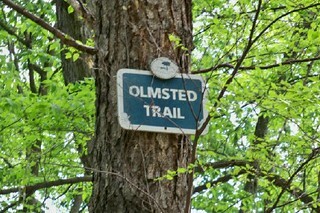 ), the world renowned firm did not design plans for the Kirby Park Zoo per say, although the Olmsted’s did (obviously) design the Olmsted Trail where the zoo most likely would have been located. Based on contemporary newspaper descriptions of the zoo, it’s hard to conclude that any of the “ruins” in today’s Kirby Park Natural Area were ever used to house zoo animals, which was a popular belief perpetrated by local news coverage. (You can read all about my research concerning the remaining structures here.) Because of all of the mystery, some people have suggested to me that maybe the zoo never existed at all! On the contrary, our local newspaper coverage shows that not only did the zoo exist; the community loved these animals so much that they were personified and their actions were often part of local news coverage. The zoo also became embroiled in controversy as community members became more aware of the potential for unintended animal cruelty because of the limitations experienced when cultivating a small community zoo, much in the same manner as other comparable zoos nationwide, like Nay Aug Park. 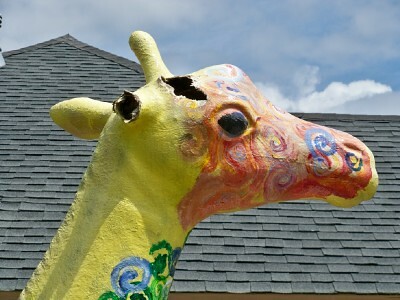 While the Kirby Park Zoo did not have a happy ending, which is most likely the main reason its history has been “lost” and its actual location forgotten, I still think that it is an important part of our local history, indicating a lot about the character of our community. The story speaks of values and politics, and tells us about what we were like as a culture during that snapshot in time through our relationship with animals. And for that reason alone, the rise and fall of the Kirby Park Zoo is a tale that needs to be told! “An eight month old black bear was presented to the city yesterday. The bear was turned over to Councilman Maurer, commissioner of parks, who had it sent to Kirby Park, where according to Councilman Maurer it is the intention to establish a zoo in keeping with the wishes of F. M. Kirby, donor of the park. The article goes on to describe how the monkey was cornered by the cat owned by the watchman at the Glen Alden Coal Company and returned to her cage at the Kirby Park Zoo. The article goes on to explain how Emery took Alex to “some kind of carnival” in Phoenixville with his neighbor and Alex’s wrestling partner, Sam Dymond, also of Noxen. Alex became too aggressive during the “performance” and injured Sam. During the return trip Emery decides to drop Alex off at the Kirby Park Zoo to “cool off” while he hangs out with the other bears for the rest of the summer. The article continues to describe the more past dangerous exploits experienced by the entire Newell Family as well as another neighbor because Emery insists upon keeping Alex around as a vaudeville money-maker. Emery tells the Kirby Park Zoo foreman William Law that he will return to pick up Alex for his next vaudeville tour. Now, as if you don’t already think this story is weird, it’s about to get a lot weirder! “When summer is in full swing, between 2,000 and 3,000 people visit on Sunday and about the same number come in during the six week days. How NOT To Take Notes! The article goes on to say that Dr. Lutes along with the president of the Humane Society would announce the final decision about the bears at a meeting, but in all probability, they would be released back into the wild. But the zoo was enjoyed by many – including the children. It added just a bit to their pleasure and helped make the park and the city of which we boast more complete. It also is to be noted that many other cities, unaided by the gift of a philanthropist, consider it worthwhile to spend their own money on such things. Furthermore, they do a good job of it. The article references the war and a submarine menace interfering with ocean travel to the extent that even banana boats can’t get through on schedule. You can be a History Detective too! 3. A 1931 article (Thank You Tom Mooney) about a howitzer (cannon?) being given to the city, saying that it was to be placed “on a platform to the rear of the present site of the Kirby Park Zoo”. Anyone remember cannon in the Kirby Park Zoo?! Ask your elderly relatives! 3. We have a picture! If you think you know where the zoo was, or if you find any zoo information while doing other research, please contact me! I’d love to hear from you…. interesting. first time i heard about this. why do they only show history people don’t care about. i want to know about history everyone can like. history should be relatable. this is great, keep blogging. You are correct! Once the zoo area was closed near the river, the monkey house was moved to that area, according to eyewitness reports. I keep hoping to find a picture of the monkey house one day! Thanks for your input! 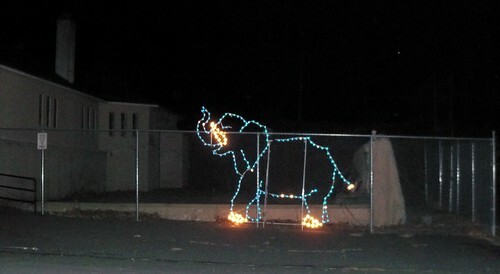 I was looking for images of the Christmas lights display at Nay Aug Park and I found your image of the “zoo graffiti”. This image is of great sentimental value to me as it was the result of an artistic collaboration between myself and a friend who means a great deal to me. I think I was a college student at the time. I came up with the idea that we should do this based on our mutual interest in the UK graffiti artist, Banksy. My friend helped me to create the stencil and to get it on the wall. I am artist and have created many things in my life, but this by far was my favorite project as it allowed me the opportunity to create something special with someone I felt very close to. I don’t see him much anymore, but I still think about him and hope that he thinks of me too at least once in a while.I lost all of the photos that I had of our project, and never imagined that I would return to that section of the park to retake them, so I am very thankful to you for posting our goat on your blog. You made my evening!